Leopard Lounge by artist Guy Combes, available from Prickly Pear Galleries. 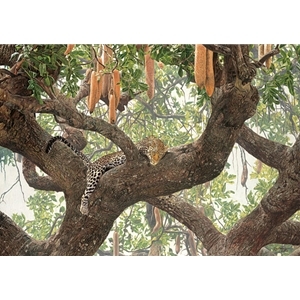 “Find a sausage tree,” says Guy Combes, “and the chances are good you’ll find a leopard as well. They are ideal for leopards, with their large broad branches to sprawl out on or to place a kill for safekeeping away from lions, hyenas and jackals. Leopards have evolved incredibly strong fore and hind leg muscles specifically for climbing trees. This trait allows them to avoid fighting with other animals of prey over a kill.